From late March to early April 2018, scores of Palestinian demonstrators were killed by Israeli sniper fire and hundreds others injured by live fire in demonstrations along the Gaza-Israel border. On 15 April, Yesh Din urgently petitioned the High Court of Justice (HCJ) together with the Association for Civil Rights in Israel (ACRI), Gisha – Legal Center for Freedom of Movement and HaMoked – Center for the Defence of the Individual demanding that the Court order the military to revoke the rules of engagement that permit live fire at Palestinian protesters along the Gaza-Israel border even when they do not pose a mortal threat. According to the petition, the rules of engagement concerning Gaza permit live fire at protesters classified by the IDF as “key agitators” or “major disturbers of the peace”, even when these individuals do not pose a clear and immediate threat to human life. The orders also permit soldiers to shoot at demonstrators for merely approaching the Gaza-Israel fence (from the Gazan side). 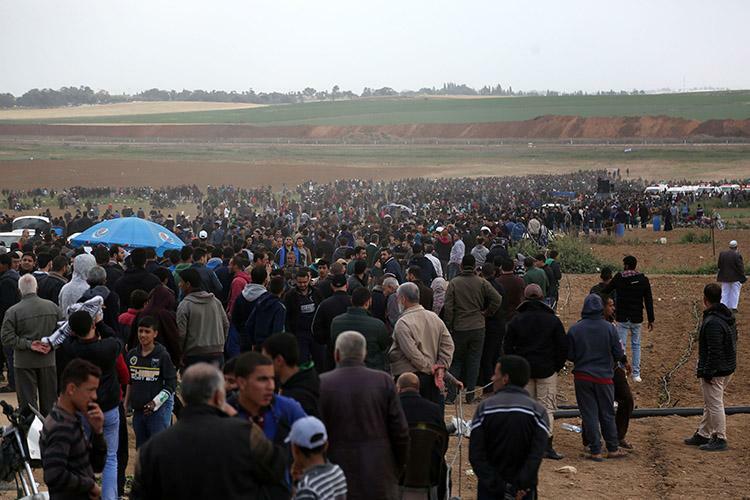 The petitioners argued that there is no prohibition on demonstrating in Gaza and that if incidents of violence or attempts to cross the fence occur during demonstrations, they alone constitute civil disturbances of the peace. In such disturbances, the law permits live fire only in cases of immediate mortal danger. Additionally, even if the area in which the demonstrations are held is considered a combat zone in light of the hostilities between Israel and Hamas, the demonstrations themselves are not combative and are therefore not subject to the laws of war. The petitioners further argued that as Israel claims it has not been occupying Gaza since the 2005 ‘disengagement’, the IDF has no legal power to declare a no-go zone within Gaza – and certainly has no authority to shoot people merely for entering the boundaries of the zone. In its response to the petition, the state argued that the rules of engagement along the Gaza border are in keeping with Israeli and international law. However, the State’s Attorney refused to reveal them on the grounds that they are classified information, and agreed only to show them to the judges in camera. The state also rejected the argument that the protests constitute civilian demonstrations which should be addressed as a matter for law enforcement. Instead, it argued that these events are part of the armed conflict between Israel and Hamas. The state further argued that the security forces on the ground are equipped with non-lethal crowd control measures and that live fire is used as a last resort against violent disturbers of the peace, by snipers, in order to minimize harm to the protesters. The state also argued that under cover of the demonstrations, terrorist acts were carried out that increased the risk to soldiers’ lives. On 24 May 2018, the Court accepted the state’s position and unanimously dismissed the petitions. Although soldiers killed at least 120 Palestinians on the border with Gaza and injured hundreds more with live fire in less than two months, the justices stated that “the soldiers are acting in accordance with the binding provisions of both international law and domestic Israeli law, and are performing the humanitarian duties they bear under the laws of war as part of action taken to prevent the conflicts and risks arising from recent events”.